Isla doing her "tummy time." When Ellie was born, Crystal had a deep-down longing that Ellie would enjoy baths, because Crystal was really looking forward to bathing her. That dream was answered and Ellie from her first try at it has always loved baths. Isla, on the other hand, isn’t so sure about this bath thing. From the sounds pouring out of the bathroom, I would have guessed that Crystal had accidentally dropped her in the lobster pot the first time she gave Isla a bath. She’s since grown much more understanding, but you can see here at 6 weeks that she’s still a little apprehensive about the whole thing. So when my lovely wife, who is not one to chase after the latest gottahavit gadget, told me that she thought a bucket would be the solution, who was I to argue? Of course, not any ol’ bucket, but a special baby bathing bucket. She does certainly enjoy bath time now, though perhaps still with a little apprehension because she’s learned it is possible to slip down in the bucket and get a mouthful! Not to be outdone, Ellie decided she needed to bathe in a bucket, too. 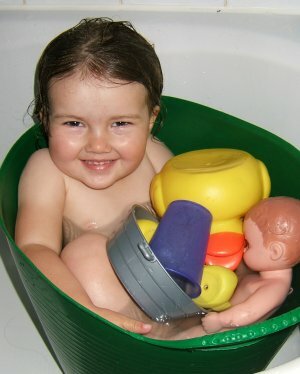 But, as big sister things go, she gets a standard-issue bucket instead of a super-special baby-bathing bucket. It seems to do the trick...at least until you run out of room for all of your toys! 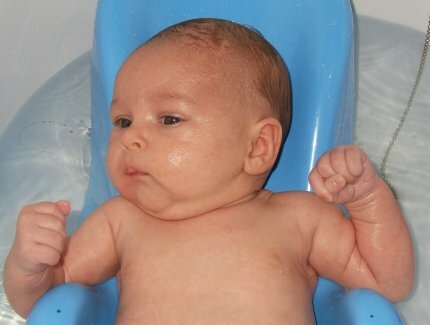 Of course, sometimes you have to ditch the bucket and return to freestyle-mode for bath time. You’ll thank me someday, Ellie, for modestly cropping this one! Isla has been flashing gorgeous smiles at us for weeks now. Here's a sample.